This was to be my most ambitious canoe trip to date. 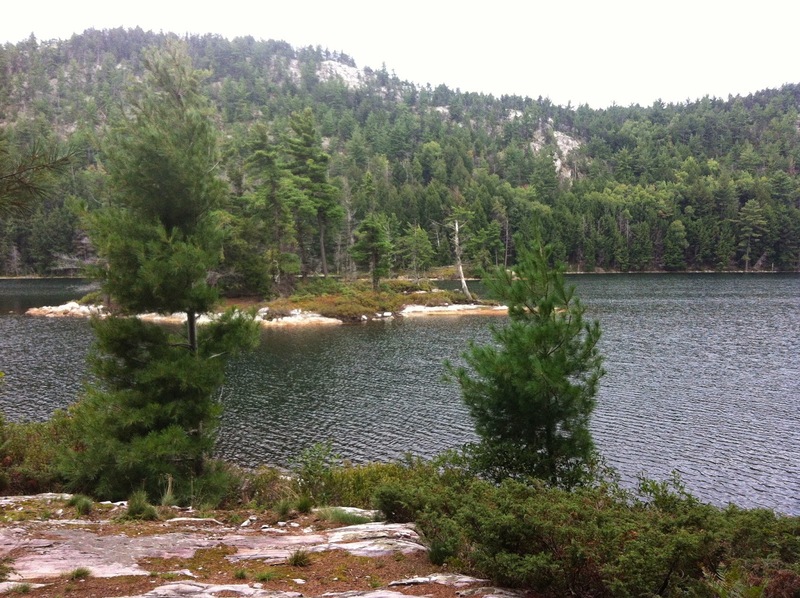 Up until this point, I had only spent a maximum of four nights in the backcountry in more southern parks like Bon Echo and the Massasauga. 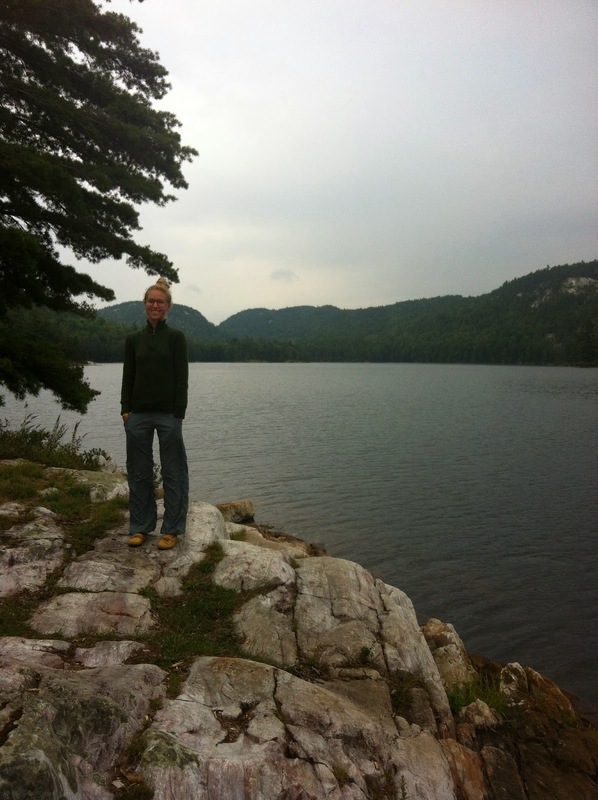 After a couple years of that, however, I was ready to take on a bigger challenge and suggested to my boyfriend of eight years that, for an anniversary of sorts, we try Kevin Callan’s Killarney Northwest loop (in the Friends of Killarney book it’s listed as the Charlton – Great Mountain loop). Also, we had just purchased a beautiful mustardy-yellow Evergreen 16′ Prospector that was a nice light kevlar. 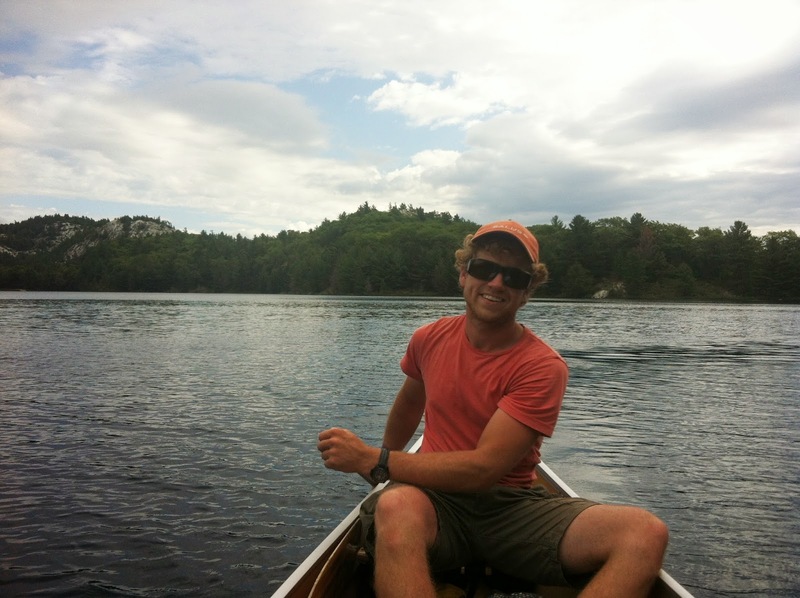 Andrew was pleasantly surprised at my enthusiasm to take on a more intense trip and even more impressed with all of the food preparations I undertook in the weeks leading up to the Great Canoe Adventure. This was my first time dehydrating food, but the little machine I bought at Walmart for fifty bucks worked perfectly. I simply made big batches of things, removed the fat, and spread the meals on the trays. No annoying measuring or separate rehydrating to deal with. We made our reservations for the interior way back in June and even still were forced to push our trip back a few days to guarantee a site on the lakes we wished to stay on. 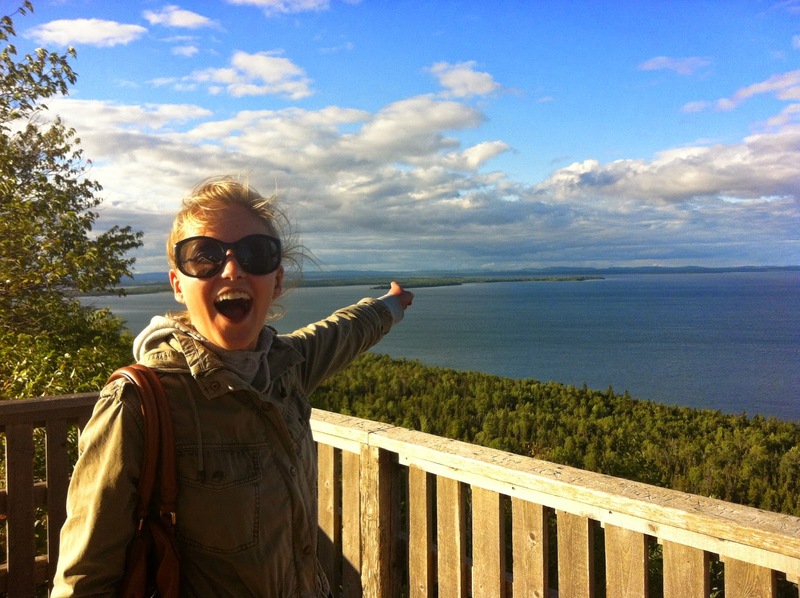 We currently live in Toronto, so we decided to also book a cabin at Widgawa Lodge for the nights before and after our adventure. 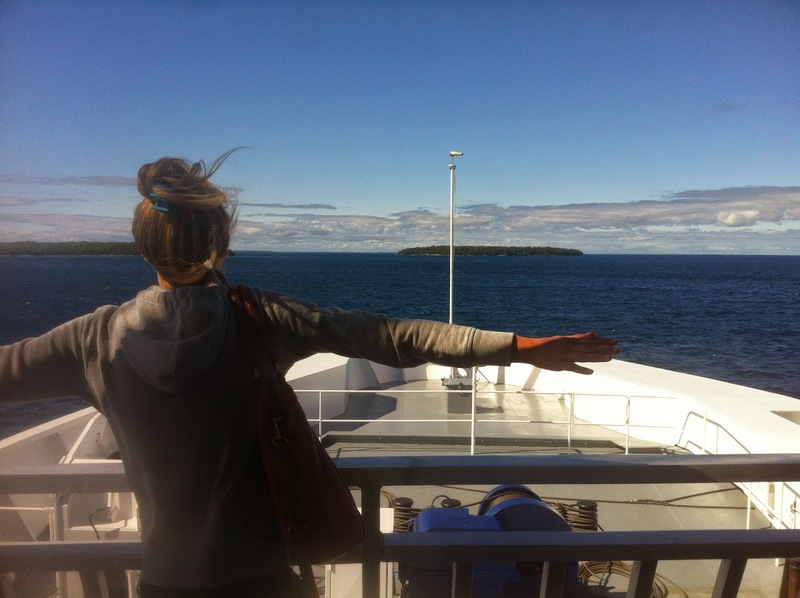 We took the scenic route on the Chi-Cheemaun ferry from Tobermory and stopped at Ten Mile Point on Manitoulin for our first glimpse of the mountains we would be portaging over. Exciting! We arrived at the lodge around 7 p.m. and barbecued up a pizza at the cabin which was slightly blackened but delicious nonetheless. We also had our last couple beers for the next week (this was really sad, as we are both beer drinkers.. I’m a bit of a beer snob).The lodge owners were lovely and allowed us to pick up our permit the night before so we could get an early start on the water the next day. Even though we thought we had planned out our trip far in advance, the closest campsite we could book for our first night was on Van Winkle Lake, at least 23 km from the lodge, so we had an early night and started out the next morning at about 8:30 a.m.
Our first day was gorgeous and sunny with little wind, and we managed to make it across Charlton Lake and up the Howry Creek in about two hours. 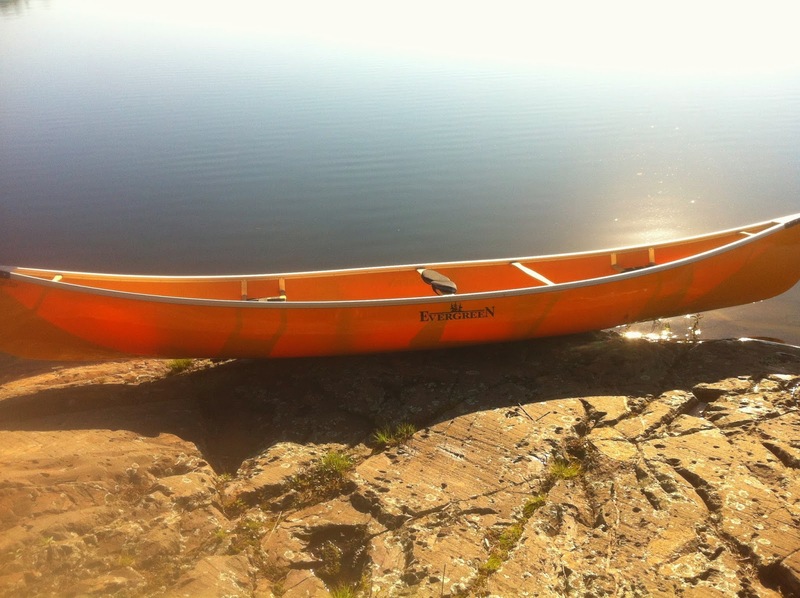 The first portage into Murray Lake was a breeze (about 250m) and we were feeling confident and strong. 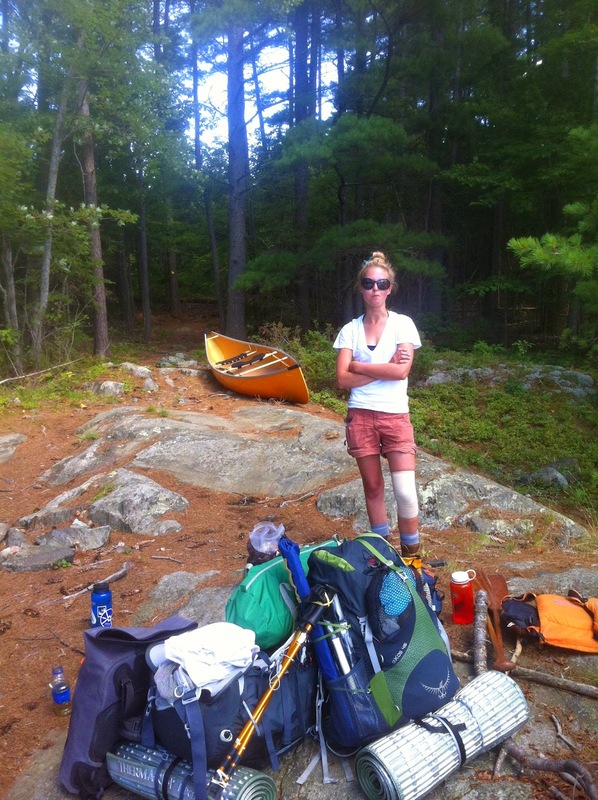 That feeling lasted until the next portage into Leech Lake (1090m), where I truly believed that the food barrel was going to break my spine into millions of tiny pieces. I should mention at this point that I’m not a big girl, only about 105 lbs, and our food barrel was tipping the scales at around 80 lbs. So I handed it over to Andrew and we ended up triple-carrying over this one which increased the distance to something like 5275m.. but at least I didn’t break my back. The next portage, into Hanwood Lake, was a much shorter 150m and we were making good progress across the lake until Andrew realized he had left his daypack at the end of the portage. He apologized profusely, but it didn’t bother me too much as it was still a beautiful day and we were out there! We were doing this! We backtracked 3km to grab it and then went back across Hanwood to reach the portage to Van Winkle. The guidebooks all said this was a really tricky, steep carry, but we didn’t have too much difficulty with it, except for the first 25m which was a bit of a scramble. We were getting rather tired by this point and stopped at the first campsite on Van Winkle (#162), which, lucky for us, was unoccupied. It was quite a nice site. A little island covered in soft pine needles and blueberry bushes (we missed the season entirely..not a blueberry to be seen in all of Killarney), and with no thunderbox and no garbage. We cooked up my homemade dehydrated chili for dinner which worked perfectly. I was worried that the meat and the beans would be gross and crunchy but it tasted just like my chili at home. We enjoyed a glass of cabernet and went to bed early, and we both slept very well after our long day of exercise. Our second day was going to be much shorter to give ourselves a bit of a break. Instead of going through the little lakes, we portaged directly north to Bear Lake and travelled east along the lake to the last campsite marked before the portages leading into Goose Lake (#218). I didn’t enjoy our stay on Bear Lake. There were lots of aluminum fishing boats with grumpy fishermen, lookin’ at us all angry-like, the clouds began rolling in, and our campsite was a giant poison ivy patch. Also, Andrew’s iPhone suffered a flesh wound on the sharp rocks in our kitchen area, and we saw a leech swim by that might as well have been an eel. We did have a good dinner though.. our frozen steak, wrapped in newspaper, was nicely defrosted by this point and we cooked it in a pan over a little fire with some instant mashed potatoes and spinach. We also discovered the delights of hot apple cider with Irish whiskey and went to bed feeling warm and happy. About twenty minutes after getting into the tent, a massive thunderstorm broke out. All night long the storm raged directly over our tent, keeping me awake most of the night. When I finally did manage to fall asleep I woke up from nightmares, screaming to Andrew that there was a bag of maple baked beans in the tent and the bears were going to find it. There weren’t any beans in the tent. Or bears, for that matter. 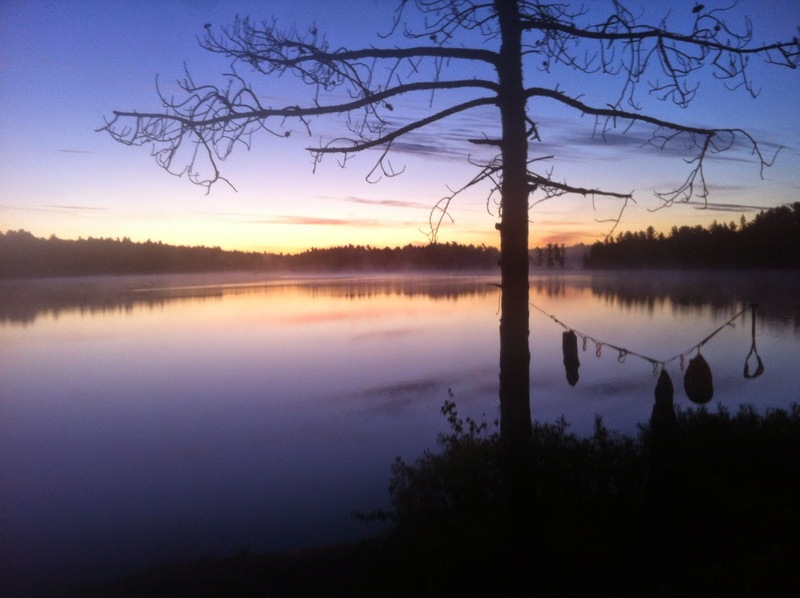 The next morning we woke to grey skies, but no rain, so we had a quick breakfast of disgusting oatmeal and instant coffee with Bailey’s and paddled roughly 10m to our first portage of the day. This was an easy 200m into Goose Lake, which was really more of a weedy pond than a lake. I was hoping to spot a moose but no such luck. I did spot a lonely adidas sandal and a cache of glass bottles. It took us a while to make our way through the lily pads to the next portage into Round Otter Lake, and our maps and guidebooks listed this as a 585m trek so we set a nice slow easy pace until we discovered, after less than 100m, that the creek levels were extremely high and the rest of the trail was washed out. What luck! We thanked the beavers for their industrious work and managed to paddle all the way down to where it says on Jeff’s Killarney Map “don’t miss this junction!”. We weren’t sure how anyone could miss it… just go right instead of left. At this point the clouds were becoming more black but we knew we only had a short paddle to get to the next portages in and out of a little log-filled pond. Stupidly, we paddled across the open water and in seconds the slight drizzle turned into a massive downpour. We heard thunder and so we were trapped on the 100m portage for an hour and a half, eating soggy pepperoni and singing songs about sunny days. You know, the one they always play on Q107 in the summertime about lying in the sun with your raa-aa-di-o? We had a restorative swig (or three) of medicinal whiskey to ward off the chill and once the rain had let up slightly we decided to book it across the beaver pond to the next portage. Our guidebooks had said that it could take some time to navigate this section because of log jams, but we had received so much rain that it was only a five minute paddle to the other side. The 300m portage into Fish Lake was pretty soggy but we were over with this one quickly, worried that there would be more rain. By the time we pushed off into Fish Lake the rain had stopped but I didn’t want to jinx it by taking off my poncho until the east wind turned my poncho into a giant sail and I had to remove it so we could actually paddle the length of the lake in the correct direction. 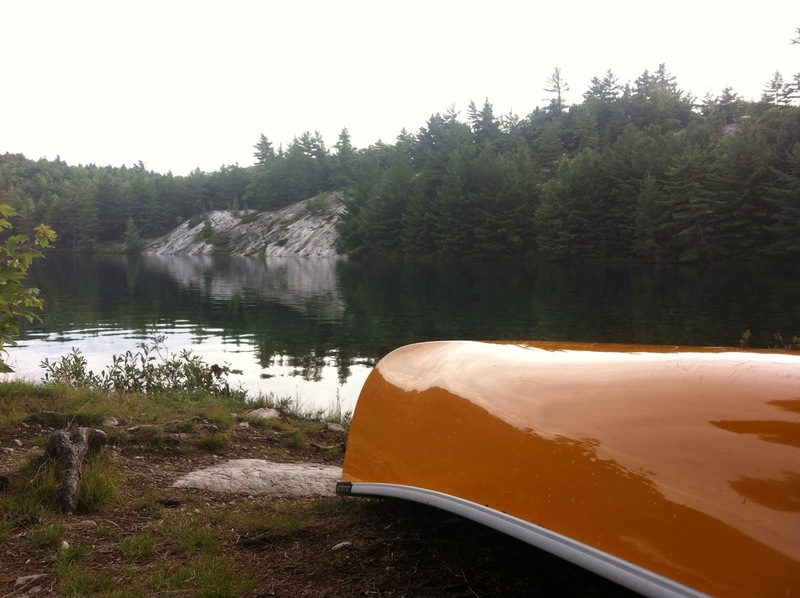 We found the 470m portage from Fish to Great Mountain Lake to be very beautiful. Enormous old trees, weird mushrooms, and a cool old trapper’s cabin at the take out. We were glad to be done portaging for the day and set out across Great Mountain Lake in high spirits until the wind picked up dramatically and we went straight for the first campsite at the north end of the lake (#158). At first we were worried we would have to find another place to stay the night when we spied a life vest on the shoreline. A closer inspection revealed that there was no one staying here (what a relief!) 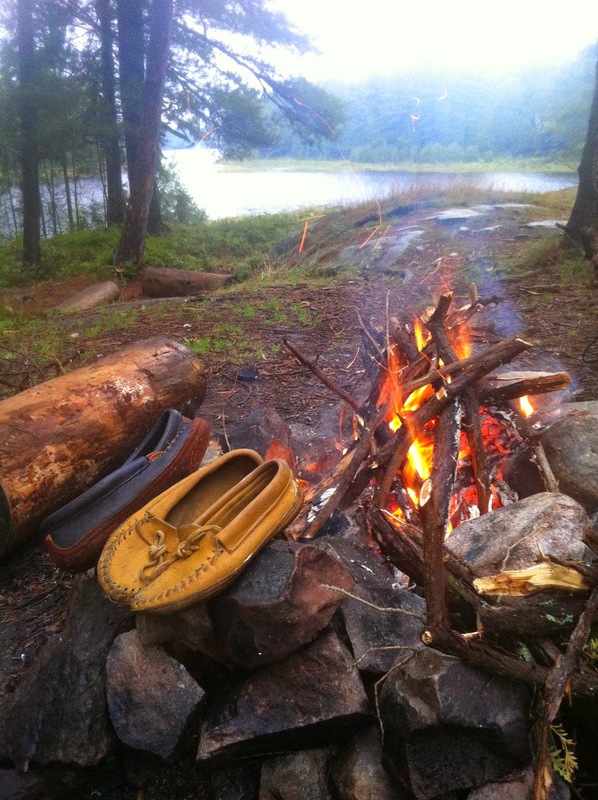 and that the previous campers had left us a massive stack of firewood to use which came in quite handy to dry our boots. The sun peeked out briefly as we made a meal of dehydrated pulled pork burritos (once again, a fabulous meal: pulled pork, refried beans, salsa, and veg all dehydrated by my trusty VitaPro, wrapped in tortillas and smothered with cheese) and we sat on some lovely sloping smooth rocks to eat our dinner and washed it down with a glass of pinot noir. A slight drizzle began again after dinner so we huddled under our tarp to have a whiskey-cider before bed. The next morning we awoke to (surprise!) 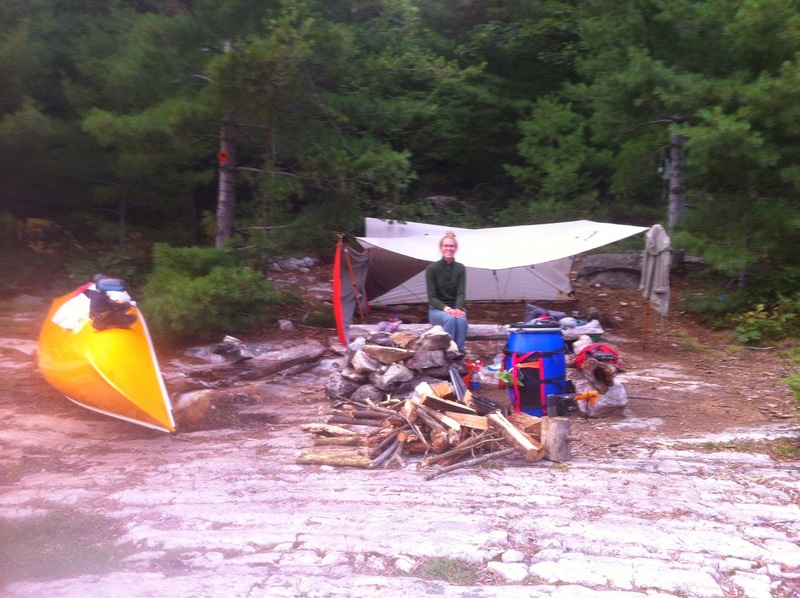 more rain and cooked up a hot breakfast of dehydrated peameal bacon and maple beans under our tarp shelter. I attempted to chase the rain away by playing some terrible blues on my harmonica, but this seemed to anger Mother Nature or the Great Spirit – most likely both – and the rain pelted down even harder for another hour. By about 10 a.m. the rain was reduced to a light drizzle and we figured this was probably the best time to pack up and head to the Little Mountain Lake portage. We finally saw the mountains that had been surrounding us since the day before once we reached the take out (everything had been completely obscured by mist and fog earlier) and the steep and slippery (but very short) 50m portage into Little Mountain went pretty quickly. Little Mountain Lake was beautiful! 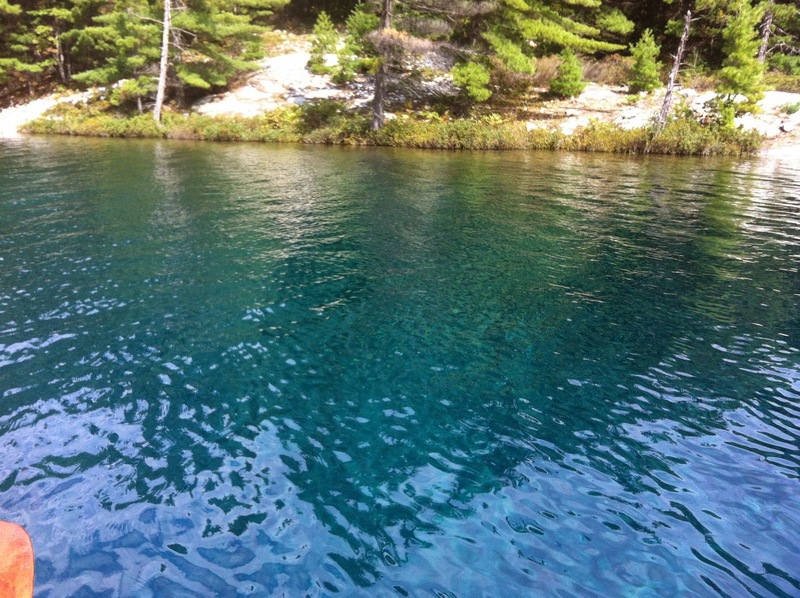 The water was the most gorgeous shade of turquoise, surrounded by quartz mountains, and we took some time paddling across it and staring down into the clear water. Our next portage was a big 900m, but relatively flat and easy until the put in which was basically a huge mucky marsh that soaked us up to the knees. We found some tasty blackberries there though, which was nice since we had missed the blueberries by about a month. 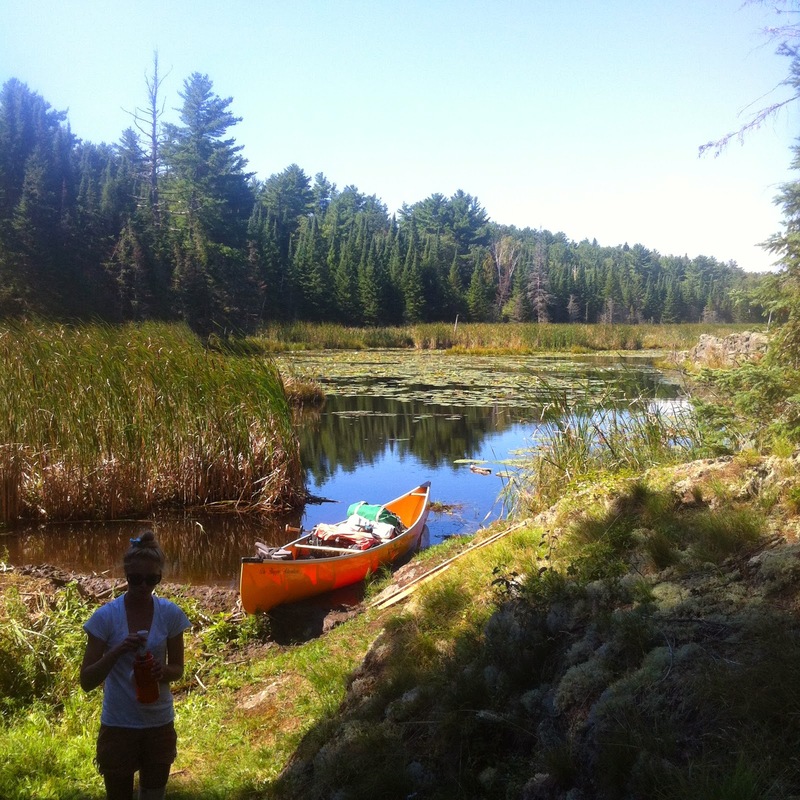 Once we had paddled across a tributary of Kirk’s creek to the next 900m portage, we met up with some paddlers heading in the opposite direction who told us that it wasn’t too difficult to get down to Threenarrows Lake. We had a quick snack of summer sausage and GORP before taking on the second 900m, which was soggy and slippery and long but not terrible. Our trip down the Kirk Creek was also pretty easy.. a few small (all under 100m) portages and a couple beaver dams to lift over, but I found this portion of the route to be quite boring. 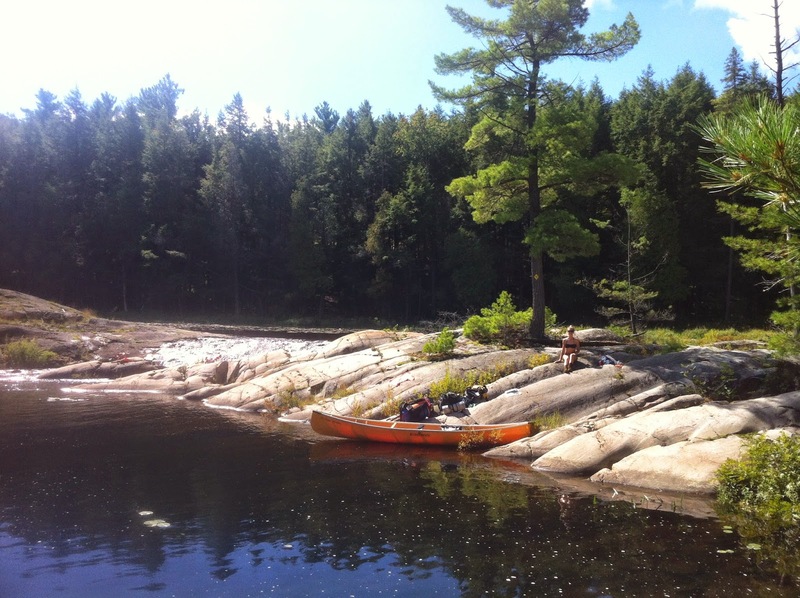 We decided to take the short portage into the far northeastern bay of Threenarrows instead of going through York Lake, even though our guidebooks had said this section was unnavigable due to low water. Apparently the dam has been fixed since the books were written because we had no issues here. This area was also a hotspot for wildlife.. we scared some ducks, saw a blue heron take off, watched a lost little beaver swim around in circles, and spied a black bear on the shoreline where the marsh starts to open up into the lake. He was a cute little bear, but we decided against taking the first campsite in case he wanted to pay us a visit later, and so we continued on paddling for another 3 or 4 km in a steady drizzle and took a site (#43) on what I referred to as the ballsack bays (if you look at the map, you’ll see what I mean). We set up our tent, tarp, and barrel line in seconds and sat in our soggy socks and ate dehydrated ratatouille with pasta which was a real treat. It was like having a fresh summer vegetable harvest! It was dark by the time Andrew had washed the dishes, but the drizzle eventually stopped and for the first time in two days we fell asleep to the sound of silence instead of the cracking of thunder. The next morning was relatively sunny (or at least not raining) and it was to be our rest day (i.e. no portages). We spent some time chilling at our campsite, making mochas for our morning coffees and cooking up a stack of pancakes and redi-crisp bacon. 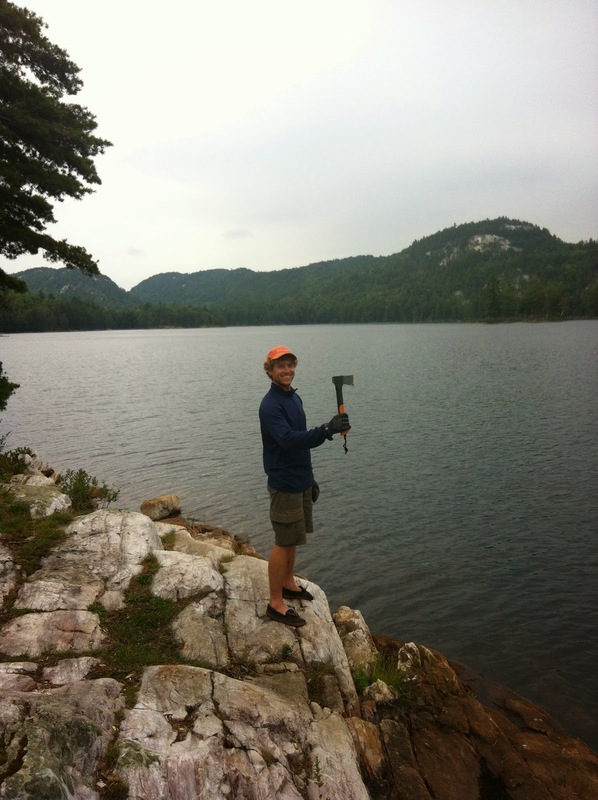 We didn’t leave our site until around 1:30 p.m. when we decided to make it to the far southeastern section of Threenarrows Lake. Around 3:30 p.m. we were reaching the last campsite on Threenarrows (#48) and came across a group of paddlers (six people, three canoes) and greeted them with a friendly hello and asked where they were headed. One guy said they were heading to David Lake (over 25 km away!) and laughed that they probably weren’t going to make it. We were very unimpressed. I’m not sure how they thought it was okay to not make their intended lake and campsite. This was our first big trip and we were taking it very seriously and had planned out our sites accordingly. 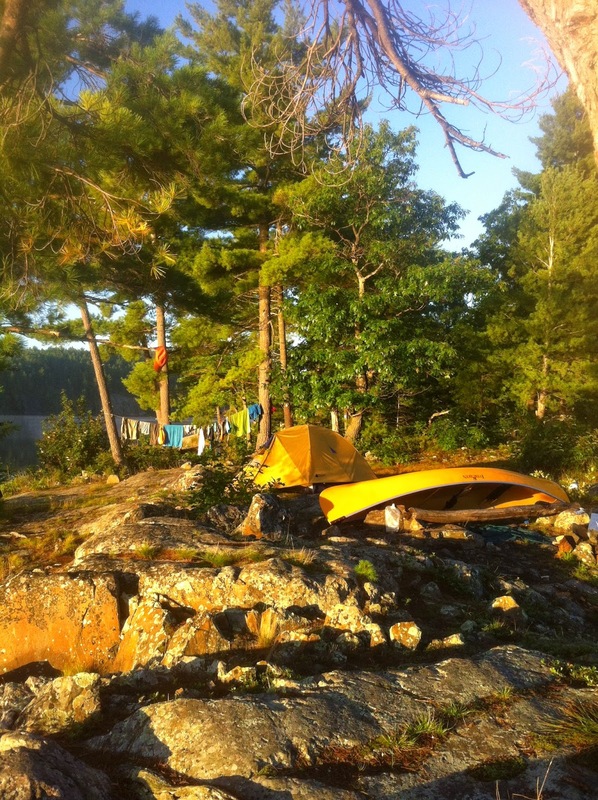 When we arrived at the site, we were very excited to see a huge campsite with lots of sunning rocks until we pulled up on shore. The place was littered with garbage. We found a paddle, a frisbee, and a pair of sunglasses, and I spent over an hour picking up bread tabs and bits of plastic and twist ties. There was even a Thermarest thrown into the bushes and I found a mound of poo-covered toilet paper only 10m from the thunderbox. I was livid. The previous campers must have just been sitting around the firepit throwing garbage over their shoulders instead of packing it out or burning it. I even found half an onion in the firepit that no one had attempted to burn. We were back in cell service so I texted my sister to get a quick weather forecast update and we were very lucky we did because a massive t-banger erupted soon after we had set up the tarp and tent. It only lasted about an hour, between five and six p.m., and Fire Chief Andrew (also known as Ray Mears) managed to get a blazing hot fire going after the downpour so we could burn all the garbage I had collected. My anger at the campers drove me to drink three glasses of wine while cooking up a delicious dehydrated soup (pureed sweet potato, corn, and black bean.. lots of chipotle and garlic and really excellent and filling) and we enjoyed the fire for a few hours and wobbled off to the tent around 11 p.m.
Our sixth morning began with beautiful sunshine so we took some time to charge our phones with our Goal Zero solar charger (we had hardly been able to take photos the previous few days due to low battery and no sunlight to charge with, and the only cameras we had were our iPhones), and we saw two deer from our site and a silly hare dashed around the fire pit for a couple of minutes while we ate our breakfast of pitas stuffed with peanut butter, jam, and dried fruit. We had a pleasant few hours making our way around the dam and through the Kirk Creek, where we saw a giant snapping turtle/river monster. These little portages, around some miniature falls, were rather fun and we were incredibly happy to be enjoying a sunny day. The winds were quite strong from the west and we had to paddle hard out into McGregor Bay, where we stopped for lunch on a large rock. We were worried the winds would make travel on the bay quite difficult, and two kayakers made some snooty remarks about our choice of vessel, but I managed to turn my rain poncho/awesome-tarp-with-grommets into a fantastic sail down the East Channel, which worked so well that it put us in the far north-eastern bay and we were vaguely lost trying to find a super narrow but really cool canoe channel a few degrees to the north. It really wasn’t too bad until we reached the North Channel. This crossing was a doozy. 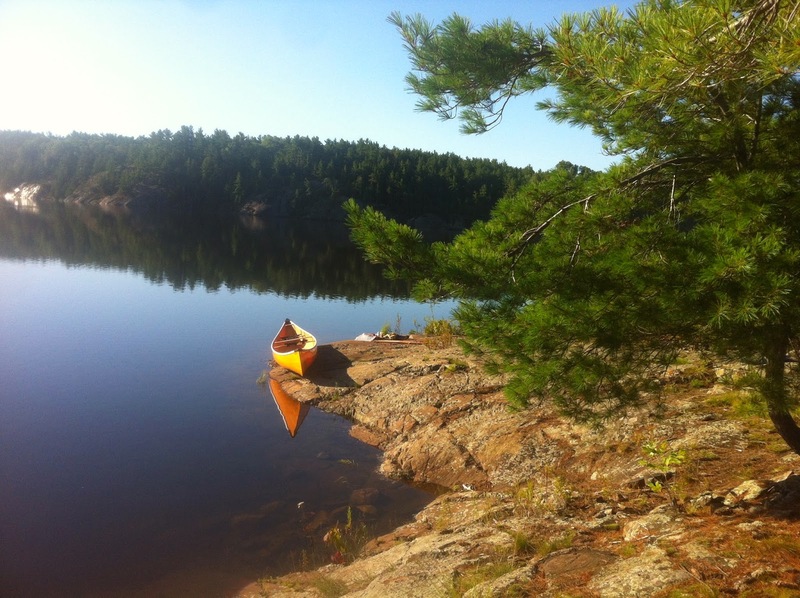 Halfway across the waves were almost a metre high and we paddled as hard as we could to reach our campsite (#134). A bit of a harrowing experience, but we communicated well and didn’t take on a drop of water. It was still sunny and nice out so we took some time to have an ice-cold shower with our useless solar shower and wash our stinky socks in our collapsible bucket. The bugs got pretty bad in this area, which was kind of surprising, being out in the winds of Georgian Bay and all. Some evil deer flies and mosquitoes were obsessed with me and I developed huge welts on my back and thighs. 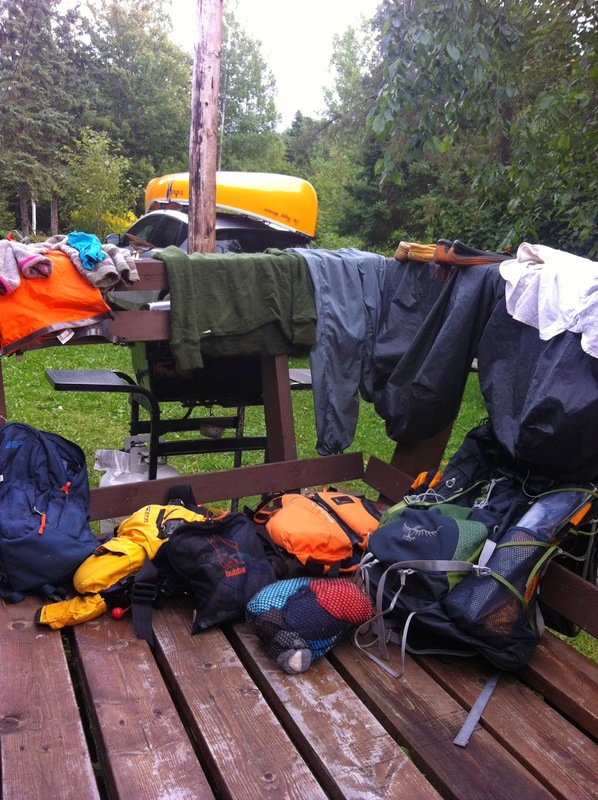 At first I blamed the fact that we were stinky, then I blamed our lavender-scented laundry (I find a few luxuries, like nice-smelling biodegradable soaps, help to make the whole wilderness thing a bit more civilized and comfortable). 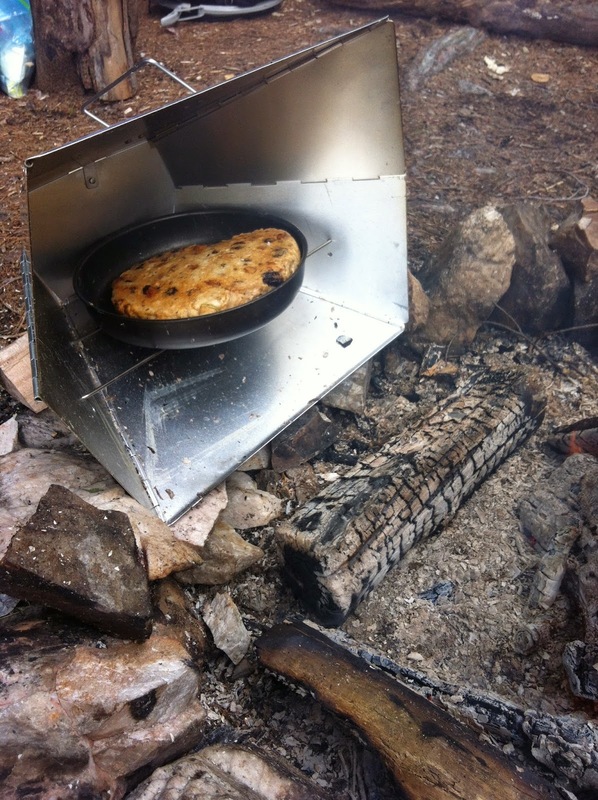 We had a lovely fire in the evening and used our reflector oven for the first time to make pita pizza with all the fixin’s. Another fantastic meal! I woke up the next morning grumpy and itchy but Andrew was his usual chipper morning self and lured me out of the tent with a Bailey’s coffee. We ate granola with powdered milk out of our camp mugs for breakfast which was actually pretty tasty and then packed up mid-morning to avoid the winds, even though we didn’t have far to go to reach our first portage. The short portages in and out of a little unnamed lake were quick and easy, and the logjams we were prepared for on Low Lake were pretty much non-existent. We had to step out onto one log to lift the canoe over but that was it. Low Lake was really pretty, and the one campsite on it was also a cute spot. The portage to Helen Lake was rather steep but short and we reached the portage to Nellie just before noon. Before tackling this 2.5km monster we had a lunch break at the beginning of the portage and then started lugging our stuff over the first 500m section to what was called Faux Lake. It was hot and sunny out and I developed a massive headache and became rather cranky. We stopped briefly for a rest here after bringing all of our stuff to this point, where I took some Tylenol and drank a full Nalgene of cherry Kool-Aid, and a squirrel threw an acorn at my back which I found incredibly rude and Andrew found hilarious. I had previously attempted to carry Andrew’s pack but it didn’t fit me properly and I decided I preferred the food barrel, even though it caused me to walk doubled over. This portage was steep! The first kilometre was tricky footing on a bunch of little rocks and it felt pretty much vertical. 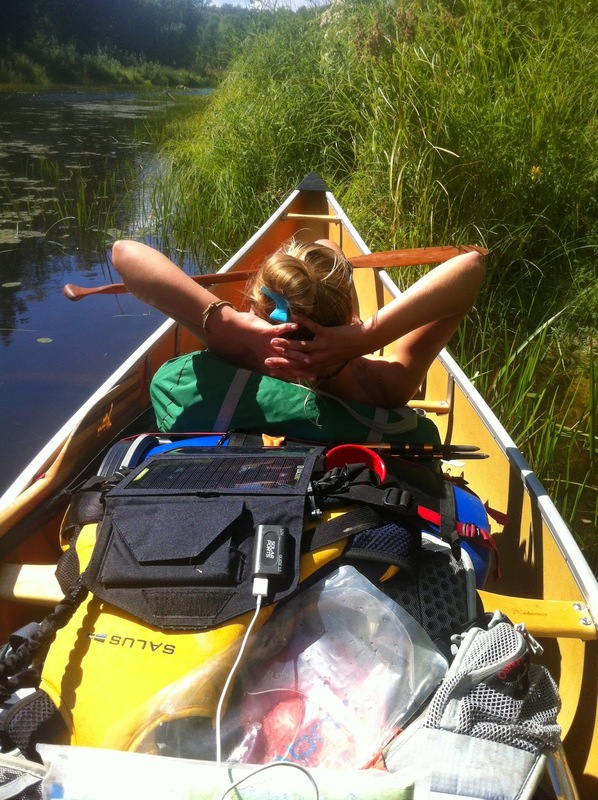 We stopped for a rest once the trail levelled out, sweaty and red-faced, and then continued slowly on to Nellie Lake. 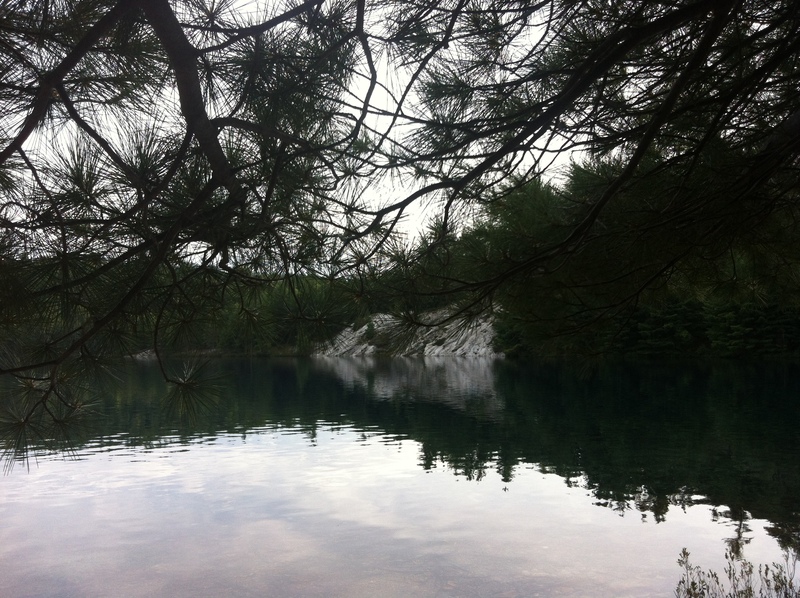 As soon as I saw the lake I stripped down to my bathing suit and walked straight in for a refreshing dip. Brr! It was cold but wonderful. As I was getting out of the water, Andrew held up a can of Stiegl Lager. At first I didn’t understand.. I asked “WHERE DID YOU FIND THAT? !” as if the Beer Gods had left it there for us and he told me he had it stashed in his pack all week for this precise moment. He tied it to some rocks and put it in the lake to chill while we raced back for our second load. The promise of a cold beer kept us going and we cracked it as soon as we reached the put in. It was the most delicious beer I’ve ever had in my life, but I was almost too pooped to truly enjoy it. We crushed the can and packed it into our food barrel and with sore, tired bodies we made our way to our campsite for the night. We first attempted to camp at the most eastern site but found it occupied, so we chose the middle site (#143) which was really lovely. Andrew went swimming in the beautiful yet freezing aquamarine water while I had a sun-nap after we set up our tarp and tent. For dinner that night we cooked a lazy meal of “fancy” ramen: ramen noodle packs with nori seaweed, dehydrated corn, mushrooms, spinach, and green onions with oodles of sriracha. I had polished off the last of the wine the night before so we drank some warm hugs (a.k.a. Bailey’s and hot chocolate) and sat on our Thermarest loungers on the rocks by the lake until I was startled by a choking noise. Of course my first thought was that a hungry bear was coming across the lake to eat us, but it turned out to be a whole family of beavers playing in the water after dark. The choking noise came from one little sneezing beaver who must’ve had a bad head cold. We listened to them goofing around for awhile by the fire and then went to bed rather late, around 11 p.m. The next morning it was clouding over slightly, but still quite nice, so Andrew re-lit the fire and cooked up a fantastic breakfast bannock in our reflector oven. This was the best bannock mix I’ve ever made, chock full of dried apples, raisins, cranberries, and cherries with a bit of brown sugar and cinnamon. We smothered it in butter and ate the whole thing before tearing down camp and heading across Carmichael to the Grace Lake portage. This was the only portage we had to do this day, and even though it was 2km long it wasn’t nearly as bad as the one to Nellie had been and we spent some time scrambling up the ridge to get a good lookout. how is the barrel still so heavy?! Of course by the time we had finished the portage, the clouds had moved in again, and more thunderstorms were in the forecast. We ended up having all of Grace Lake to ourselves for our last night out, and we climbed another ridge behind our site (#179) and were rewarded with a fantastic view of where we had come from. The rain held off, we got to see a bit of a sunset, and we cooked up another batch of sweet potato soup for dinner and washed it down with several whiskey-ciders. Andrew built another lovely fire to dry out our wet boots and moccasins and we stayed up late again listening to the loons. I slept terribly our last night out. I woke up in the middle of the night in an actual puddle of sweat. I have never sweat so much in my entire life. I’m not sure if it was my down sleeping bag or the lack of ventilation in our tent that caused it, but I was forced to use a wool sock to mop up the pool so I could sleep again. Gross. It was raining again and I was damp and miserable when I woke up the next morning. There was a brief halt in the rain while we made breakfast (granola) and we reluctantly packed up our gear for the last time. Once we reached the portage from Grace into Cranberry Bay it was just chuckin’ rain and the whole trail turned into one giant stream of muddy water. 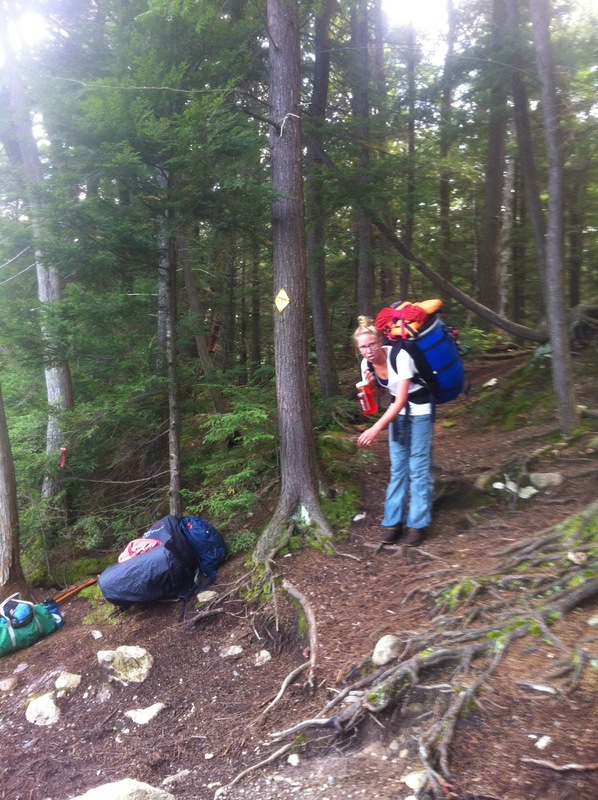 The maps said this portage was about 1700m but it felt like over 2km. When we finally made it to the put in with our second load, the rain slowed down to a slight drizzle and we decided to take advantage of the relative calm to cross Frood Lake. 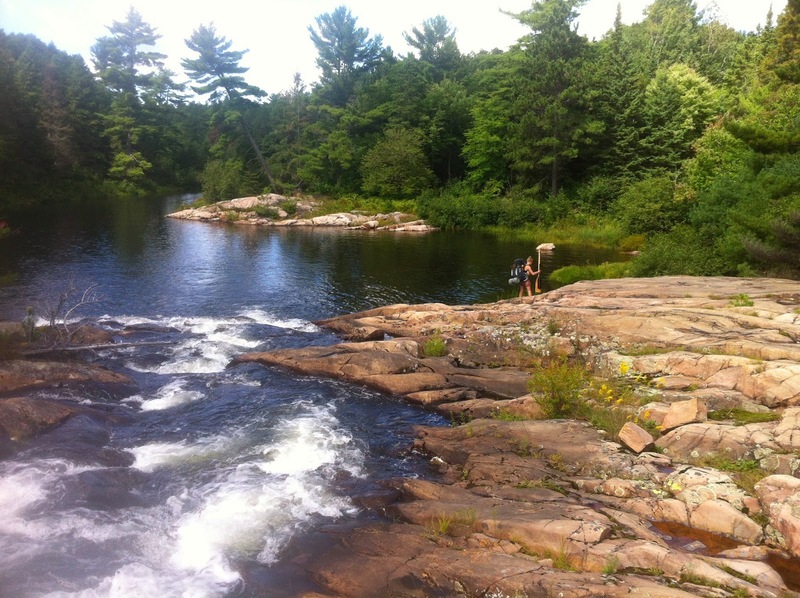 About halfway the sun poked its face out slightly to cheer us up, the wind stayed down, Andrew caught a massive largemouth bass in the channel between Cranberry and Frood, and we slowly paddled back to the lodge. We met up with a couple and a puppy in a canoe around Willisville and warned them about the mucky soggy wet portage into Grace, and then noticed more dark skies to the west and rushed to reach the little river that would take us back to the lodge. 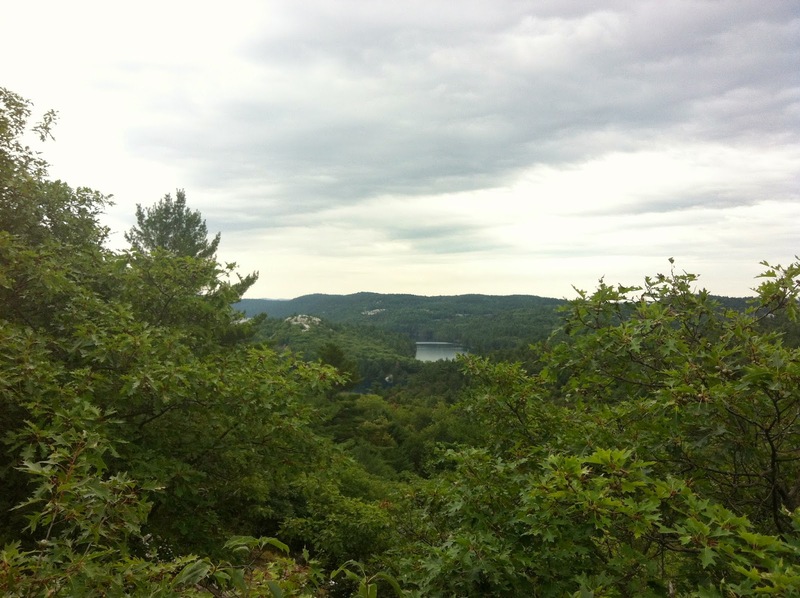 Lucky for us, the rain never materialized, and we arrived at our cabin in a bit of a daze. We decided to be lazy and not portage the canoe to the cabin, and instead put it on the car and drive it over, which proved to be a horrible mistake as the car slid downhill and got stuck in the mud. Thankfully, Josh of Widgawa Lodge used his ATV to drag Andrew’s Mazda out and we went to the cabin to unpack. Instead of showering right away, we hung all of our wet gear on the little deck. I think we were still in camp-mode. After all this was done, I headed to the shower house and MAN was that good. 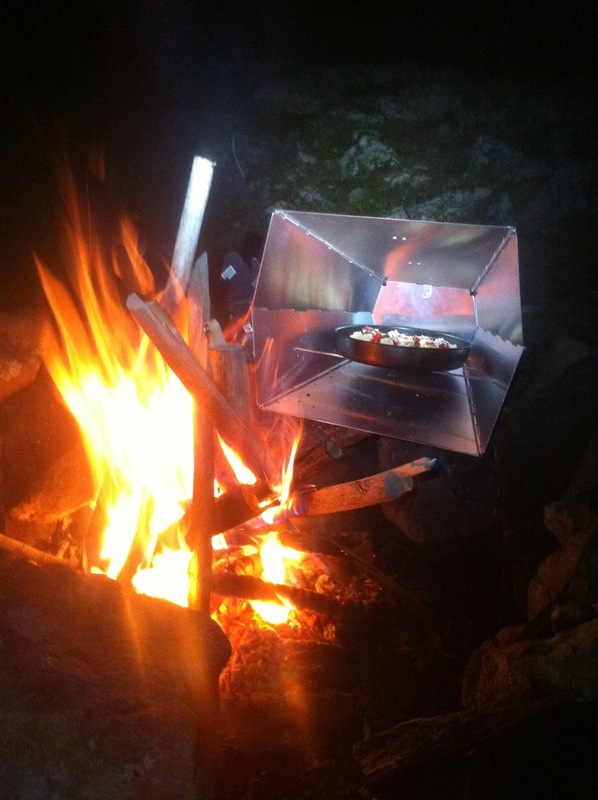 For dinner that night we baked up jalapeno-cheddar biscuits on the barbecue and ate them with dehydrated pulled pork. By this time I had earned the title of Head Camping Chef to go along with Trip Planner Extraordinaire (although we did fire the trip planner a few times on some of the longer portages). We had left some beers in the car for our return and had one each before falling asleep well before 8:30 p.m. It was hard to leave the little cabin the next day. 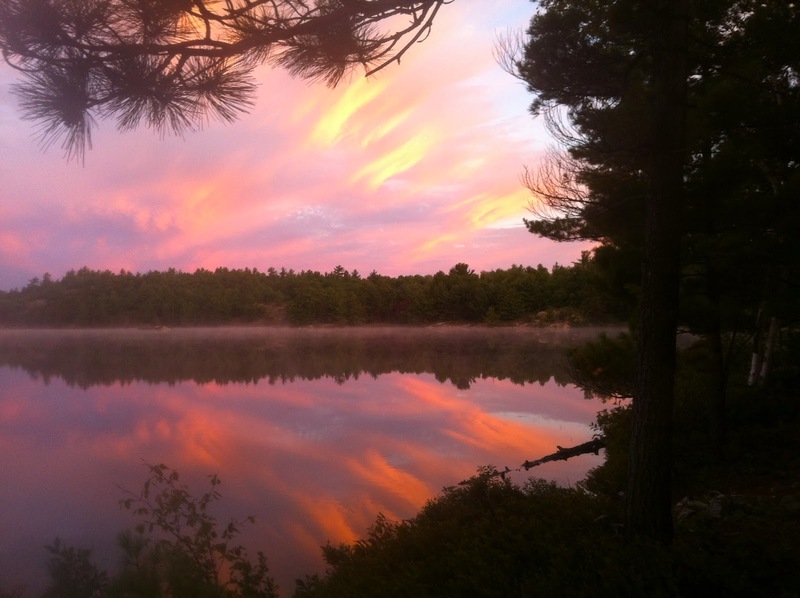 We weren’t really ready to head back to the city so we cooked up our last ration of pancakes and redi-crisp and hung around until about 1 p.m. We were taking a different way home, north through Sudbury and then all the way back to Toronto. We stopped a couple times on the way, and reached our place in the city around 7:30 p.m. where we ordered a pizza and decided it wasn’t as good as the meals I had made for our trip. I was super bummed that our adventure was over, and have already started researching a more badass route for next year. It was an incredible experience and probably one of the coolest things I’ve ever done. I can’t wait to do it again! Loved reading this! 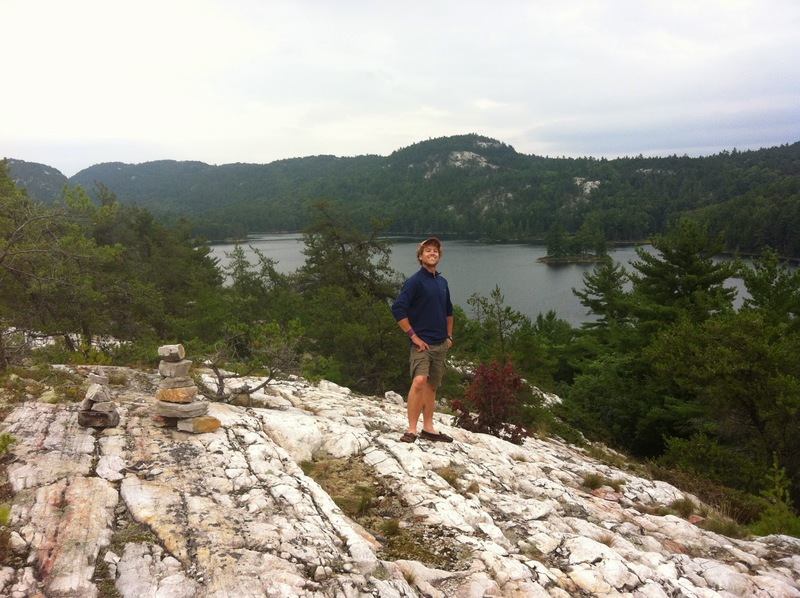 So many similarities with our experience – we started out in Algonquin before going to Killarney 2 years ago and Temagami last year. 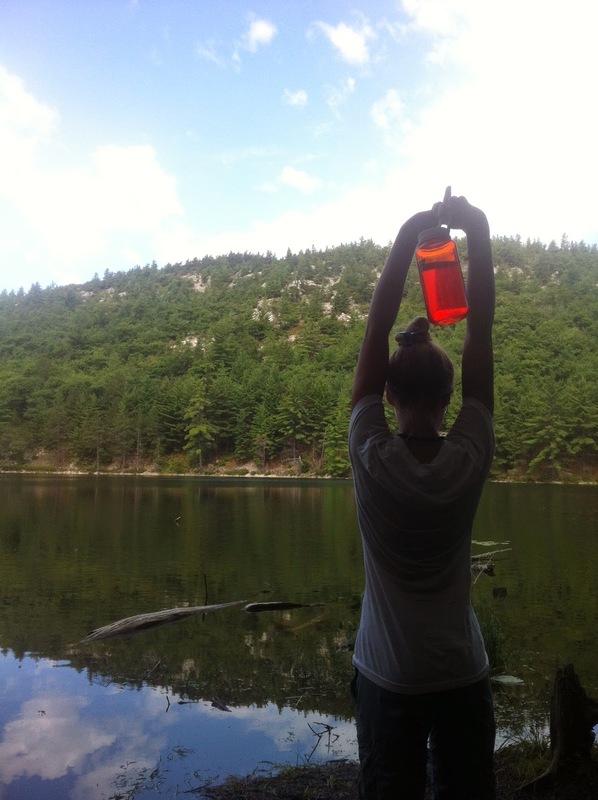 I am also all about great camp food though my husband is the “trip planner extraordinaire”. 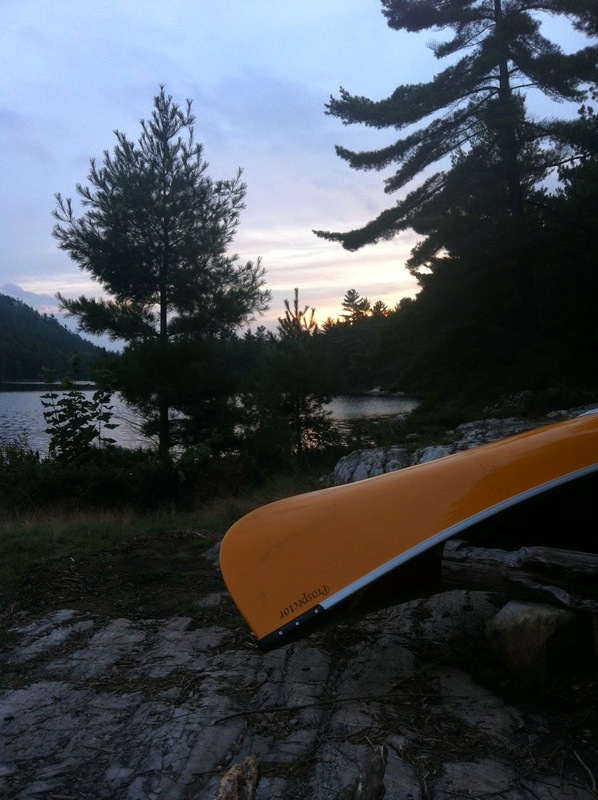 Thanks for releiving my midwinter canoeing withdraw – i love all your pics and stories!